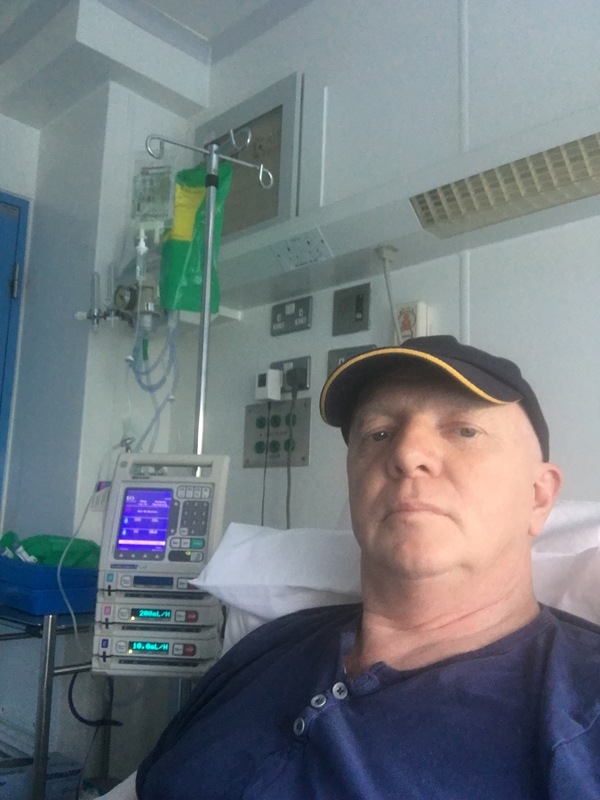 Everything since the 9th April has been done to prepare for these 7 days, all the ICE chemotherapy up to the stem Cell harvest on the 6th June. The is no B plan this is it a real “do or die” situation. B.E.A.M is a high-dose chemotherapy treatment. It’s given before a stem cell transplant. A stem cell transplant allows for a much higher doses of chemotherapy. On the first day (day minus 7), I will get the carmustine as a drip (infusion) over two hours. Once I have the Transplant then the clock starts again as day 1, it is expected that by day two I will be on morphine. 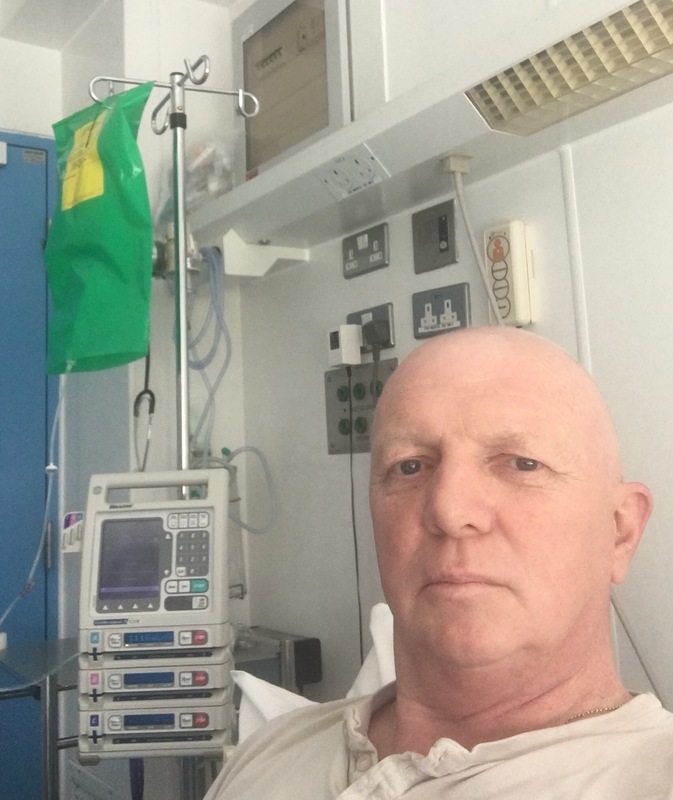 Chemo can be painful but when you kill all regenerating cells and then dump 60 million harvested stem cells back into the body it is like a gigantic war starting. Basically the stem cells will attack the Chemo drugs and at the same time retrigger bone marrow production. The expected result is that everything from my mouth to my bowel will blister – they suspect that by next weekend I will be unable to eat or drink for at least 72 hours. But this team are really excellent and I believe we will do it. The mental build up to this has had its difficulties. But I am only human so it’s allowed. 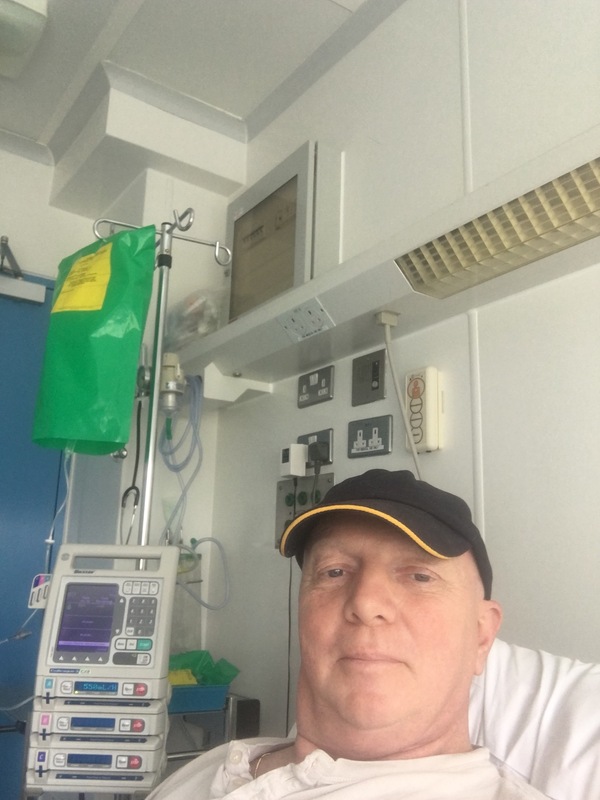 6 weeks since last Chemo and 4 since Stem Cell harvest- I have been quiet tired since harvest due to low blood counts but just high enough to avoid a blood transfusion. I walk a couple of miles every day and/or cut the grass, clean house etc. There is no way I could have run a business during ICE or even now. Recovery according to my doctors has been incredible but I really want to push this harder. Day Minus 7 Thursday 6th July 2017. Here goes. Started day with blood samples & then on for a PICC line. As explained in my cycle 1 of ICE a PICC line is a line going from a vein in my arm to my chest, they are used for advance chemotherapy as I will be spending most of the next few weeks on various drips, these included BEAM, steroids, transfusions, saline, antibiotics etc. Day Minus 6 Friday 7th July 2017. Two lots of Chemo today starting with etoposide two lots over 4 hours plus cytarabine for 1/2 hour also have etoposide tonight for about an hour. This will be replicated for 4 days so it’s minus 6 to minus 2 exactly the same. Not as much anti nausea been used. Staff here is St James are fantastic. Everything runs like a well tuned and oiled machine. Like myself they prepare for the worst and hope for the best. This is only the start. same regime as yesterday. I am allowed to walk the hallways in the hospital but from tomorrow on that may stop as my immune system is gone completely & my baseline blood levels are low. But all in all I’m handling this okay, they are long days starting with blood test at 6:30am and the Chemo finishing at 10:30pm. So it’s old army style warefare I sleep & eat whenever I can & return to the battlefield, the battlefield been the hospital bed. My gut feeling here is I am winning the war with the final battle now at hand. 3 years and 5 months this has taken. Just a couple of topics I would like to share with you. Firstly the cover photo of the double doors – this is actually the first set of double doors to enter the ward, behind these doors are another set, after you go through these there is a nursing station where the check to see if your on a visitors list, then it gets even tougher to enter the treatment wards with another double set of doors behind which are yet another set. But these doors can’t be opened at the same time, the inner section is air conditioned. When you through these doors you will meet the nurses who take care of the patients & be under no illusion these nurses will decide if you can see the person or not, no ifs no maybes they decide. To enter the individual rooms there are more double doors, you must close one before you open the next one, this is to protect the person in the room – without any natural defence system the victims are completely open to infections and anything even a cough could kill. As the regime continues I find myself wanting to stay in the room more. Second topic. There are a large number of people reading these blogs, ranging from friends to victims & family members of victims. One of the readers a young lady just 19 years old & Stage2B HLD is awaiting a PET scan next week following first line treatment in LA, this lady has also wrote a number of blogs primarily in relation to awareness of swollen Lymph nodes but what caught me was a comment she made prior to even seen a doctors. She felt deep inside that she was been attacked by cancer, I remember thinking something similar weeks before the Lymph Node swelled. Could it be that our bodies warn us and we simply ignor it, could it be our brains early warning system triggering an alert. Awareness is everything and regular screenings are vital. If doctors catch you at stage 1 or 2 your chances of survival are massively increased. Listen to your body and mind……..
Day Minus 3 Monday 10th July 2017 Last day for the B.E.A today, tomorrow I get the Melphalan (there calling it the push I’ll explain tomorrow) I am starting to really feel the effects of these drugs. Tiredness and sudden loss of appetite. But when I’m not on the Chemo drugs I do tend to get out for a walk- about 5 times a day. I am not in full isolation yet (not permitted out of room) I should have been isolated from Saturday but my blood counts are still high so I’m allowed to walk the corridors. Extra anti sickness are been used from today and lots of mouth wash. The mouth and throat are the first main targets after cancer cells by this Chemo. I may have already mentioned this but the staff here are wonderful. This is a split 21 individual roomed Ward further split into two units. From the Professor to the clearer they are all gentle caring dedicated people, I am always amazed at how they do it, I know I’m seriously ill but I’m also very strong but there are some critically ill people on these wards, I’m on the Red Ward which is basically for critically ill victims, I serious hope to keep my strength up. Right now it’s 11am and I have just covered the first hour with 3 hours to go, then a break till 10pm. 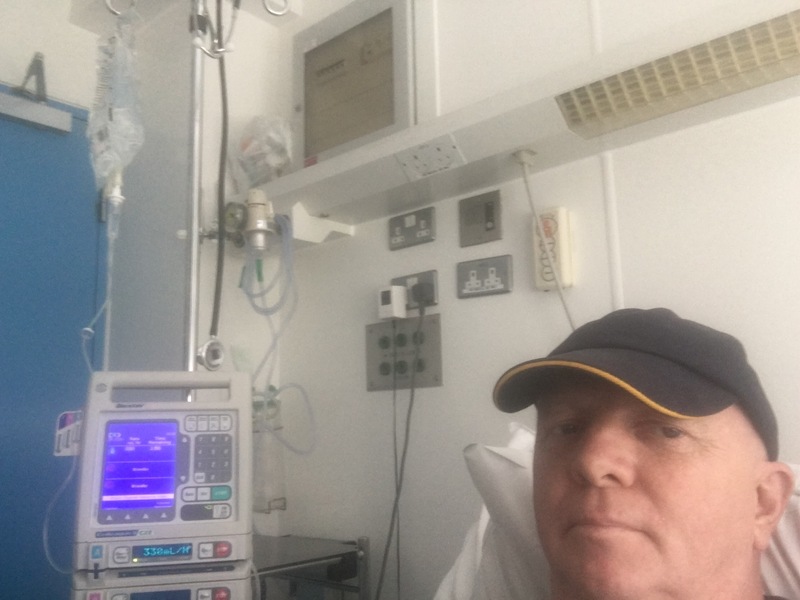 The Stem Cell transplant is now 72 hours away.